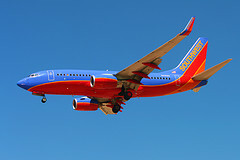 Authorities detained a passenger aboard a Southwest flight that landed at Seattle-Tacoma Airport yesterday on its way to Denver, after reports that he created a bunch of creepy names for his in-flight WiFi hotspot, naming it “Southwest – Bomb on Board” and making comments about the attractiveness of flight attendants, among other things. According to ABC News, passengers started to worry when they realized the weird names popping up during the flight. Whether or not he was just goofing off like an insensitive jerk — especially in light of the fact that the flight was on Sept. 11, as the passenger pointed out added an extra layer of concern — authorities ordered the plane to a side tarmac, surrounded the plane and took the man into custody. All passengers deplaned and bags were re-screened, before the plane could be reloaded and back on the way to Denver. Southwest said it was the captain’s decision to report the potential security threat, and that the airline’s “highest priority is the safety and security” of passengers and employees.